What if you could learn everything you need about finance in less than 10 minutes? Well, according to University of Chicago professor Harold Pollard, everything that you need to know about money can fit on a simple 3×5 card. Pollard was chatting with journalist Helaine Olen about how necessary most of the financial planning industry is when Olen challenged Pollard to put everything down on paper. He did…and it went viral. Pollard had since published an entire book with Olen that further discusses the card. Why would this be important to you? 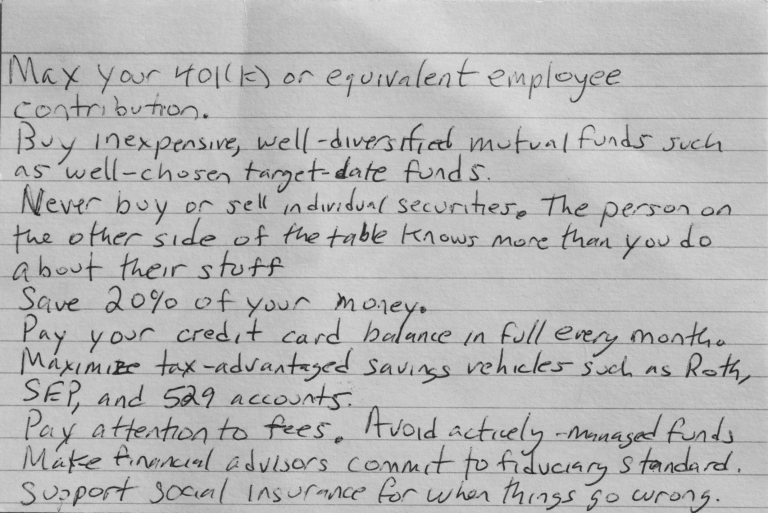 Because instead of paying for a financial advisor this 3×5 card has all the information you’ll need.